“IN THE MORN of the resurrection, a woman was counted worthy to bear to the disciples the glad tidings of a risen Lord. But in the nineteenth century, she is counted by some brothers unworthy to tell the same tidings to the little children in the Sunday-school.” With these words, Silena Moore Holman (1850–1915) challenged prevailing teachings within the more conservative southern tradition of the Stone-Campbell Movement, eventually labeled the Churches of Christ. Holman emerged at the end of the nineteenth century as the movement’s most articulate defender of a greater sphere of engagement for women. She and influential Church of Christ editor David Lipscomb engaged in a famous debate over the issue in the pages of Lipscomb’s journal, the Gospel Advocate, beginning in 1888. Holman had come to her conclusions from her own life experience. The wife of a lay leader in her congregation, she mothered eight children, actively participated in her church in Fayetteville, Tennessee, and served for 15 years as the president of the Tennessee Woman’s Christian Temperance Union (WCTU). During her tenure, she increased WCTU membership from 200 to more than 4,000. In all these actions, she represented the “new woman” of the late nineteenth century—a woman who enjoyed access to education and sought to participate in spheres once labeled “men only,” such as social reform movements and church leadership. 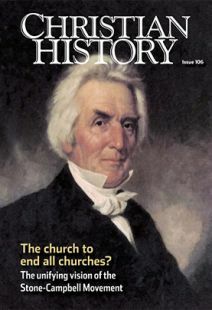 Her adversary, Lipscomb, along with southern churches who read his paper, opposed any public role for women in church or society. Lipscomb believed organizations such as the WCTU enticed women away from the joys of raising children and tending the home. According to Lipscomb, women who attended conventions, and especially those who spoke publicly, violated scriptural limits. He relied on passages such as 1 Timothy 2, which told women to keep silent in the churches and not to assume authority over men. In her vision of women’s roles, though, Holman also upheld the Bible, crafting a well-reasoned scriptural defense of larger opportunities for women to lead and teach.